Man…a weird, emotional day. I loved every second. Today I stood in several places that were heretofore just part of my imagination. I can’t count how many times over the last 50 years I’d wondered where these guys lived, how they lived, where they played, hung out, went to school, etc. Well today, I found out. My entire morning was taken by David Bentley of Day Tripper Tours. What a gas. 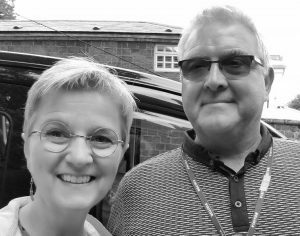 He’s so knowledgeable, personable, funny…it was a pleasure to be his singular guest for several hours. He was also a great storyteller, and one of his tales blew my mind. More on that in a minute. We went so many places and saw so much, I’m afraid I can’t remember it all in order. But we did see the two homes that the National Trust Tour (which I took later) didn’t feature: the boyhood homes of George and Ringo. George, for those who don’t know, had a very loving, secure childhood and adolescence. His family were close-knit and supportive of him, and he never felt unloved. 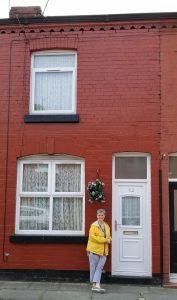 He lived in this tiny row house in Speke (a suburb of Liverpool) for the formative years of his childhood, before moving into more spacious quarters in Upton Green later on. George was born in this house. It’s now privately owned, so we couldn’t go inside. Same with Ringo’s boyhood home, which is undergoing a major construction project, so they had the area blocked off. Fun fact: George and Ringo were born at home. John and Paul were both born in the hospital. Most interesting to me was the history of how the Lads met and began making music. As is well known, they weren’t the Beatles first; they were the Blackjacks, the Quarry Men, then Johnny and the Moondogs, Long John and the Silver Beetles, the Silver Beetles, the “Beatals,” then the Beatles. 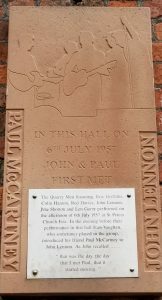 It was John and George and some school friends first; Paul didn’t join till well after the now-famous Woolton church fete where he met John for the first time, and Ringo not until long after that. I’ve always been particularly interested in their Hamburg years, when they really learned to play as a unit, and they polished their act under the most horrible working/living conditions ever — only to return to Liverpool and conquer the world. Such a great story. Of course, David covered the Penny Lane story. There really was a barber shop and a banker who never wore a Mac (raincoat) in the pouring rain. There really were nurses selling poppies from a tray behind a shelter, in the middle of a roundabout. Paul really does remember “four of fish” (fish and chips you could buy for fourpenny) and firemen running about. What you may not know is that the song “Penny Lane” isn’t really about the street, per se, but just the general area around it. Still a classic. After I said goodbye to David, I took the National Trust tour, which actually allows people to go inside the childhood houses of Paul and John. Of course, no photography was allowed inside, but suffice to say that it was impressive how so much living could be undertaken in such small quarters and still call it a “house.” Incredible. What sort of bothers me to this moment is a story David told me when we visited the cemetery behind St. Paul’s Church in Woolton. Blew my mind, actually. Paul has always maintained that he made up the name “Eleanor Rigby,” as well as the story behind it. Well, David has another version on good authority, and I’d never heard it. John spent a lot of private time in that cemetery, “talking” to one of its inhabitants — his uncle George Smith (Aunt Mimi’s husband, who died when John was 15). Other friends had witnessed Paul and John goofing off in that area, and then, when the monkey business was over, John would retreat to his uncle’s grave, lean against the headstone, and talk to him. All the Liverpool friends spent lots of time in that cemetery. Paul had to have seen this gravestone at some point. Anyway, at the time, John told his buddies he was going to write a song about a girl called Eleanor Rigby; even explained the circumstances (she suffered from depression, so she kept her public face “in a jar by the door,” and ended up dying young and alone). 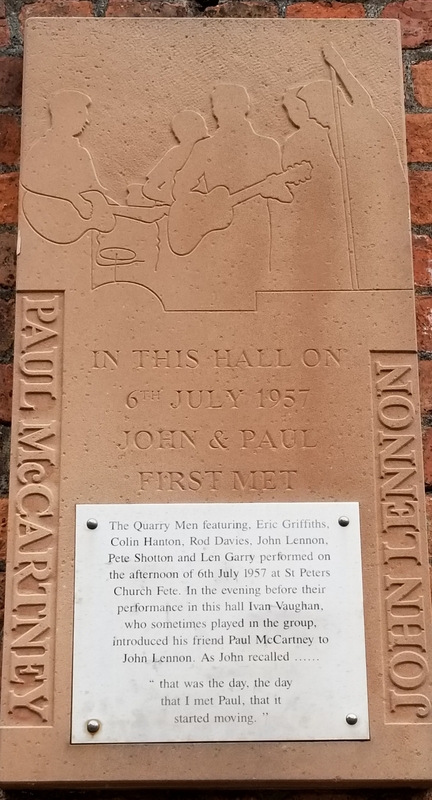 It was much later (1966) that Paul turned up at the studio and said he’d written a song about a person named Eleanor Rigby — complete with the details John provided all those years ago — and never acknowledged John for any of it. This is now known to many Beatles cognoscenti as the true beginning of the end of the band. Interesting, eh? Maybe not. Truth is, Paul and John disagreed on many band issues. For instance, Paul claims credit for the entire tune of “In My Life,” but was never credited with such by John. Bummer, because that song has consistently been at #1 or close to it on every Beatles “best song” list since they broke up. OK, enough yammering. Are you still with me? If so, I promise to dispense with the lecture tomorrow. One more day in the north, then it’s off to meet fellow RtB fiend Suzanne in London. Wahoo! Do not dispense with the lecture! This is off the chain, who wouldn’t love reading this? I too wish the lecture rambled on ~ the only way I am going to learn anything about those bugs is from you and it is worth the listen ~ so glad you are filling that noodle with more Beatles trivia. My mother would tell how her family would go to the cemetery on a Sunday afternoon and sit there all day – must have been an English thing to spend time in a cemetery!. I know a few Beatles songs but not much about them and their history. Now you are my Beatles tutor, and I’m really appreciating your “lectures.” Thanks! Thank you for keeping us all in your pocket on this trip…loving every moment right along with you! Great story and wonderful you are getting such a great in-depth tour!! Not surprised about the photo ban. Most historical places in England won’t allow it but they WILL suggest you purchase a guidebook, beautifully illustrated with colour photos–for a nominal fee, of course! This sounds like a dream come true for you! I am glad David was able to share some new info for you. In 24 hours I will be headed to catch the train to London and you, yeehaw!! Awesome stories, and don’t stop sharing. ?. Still bummed we can’t meet up. Sure that you canopop over to Bath? ? Hey, thanks for commenting, everyone! It’s been a long, long couple of days, and I’m on the track to London tomorrow (definitely next time, Jeff! ), so I’ll be in touch again. Your comments give me great joy on this little odyssey. Thanks for coming along!